A contemporary bone china small mug featuring a delightful bunny. A perfect christening or baby gift. This item is supplied gift boxed. 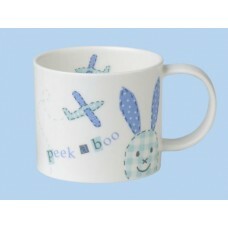 Each mug is hand decorated with a printed ceramic transfer in our Stoke-on-Trent studio. The quality is excellent, just as you would expect from, bone china made in England.